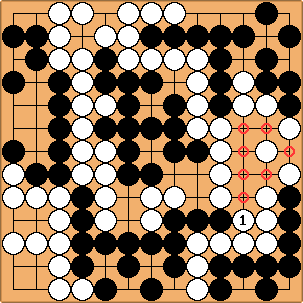 Black has 5 points of territory in the top right, 2 points in the middle, 2 points in the bottom right, 3 points on the bottom side, and 7 points on the left side, for a total of 19 points. White has 6 points in the bottom left and 8 points elsewhere for 14 points of territory. Adding komi of 5.5 brings the total to 19.5 points. All White has to do is make the largest play. The hane-tsugi, - , is a gote that gains 1 point. Then - is a 1 point sente. Next gains 0.75 point. Finally, gains 0.5 point. White could also win with the reverse sente, . Below I derive these miai values. makes 1 point in the top left corner. would prevent Black from making that point. The local count there is +0.5 (scores are given from Black's point of view). gains 0.5 to make 1 point; would gain 0.5 to make 0. The miai value of a play is thus 0.5. If Black plays , he scores 5 points in the corner. After , what is the count there? Black has 3.5 points there. If he plays at a he scores 4 points, while if White plays at a Black scores 3 points. This is like the top left corner. Before the count in the top right corner was 4.25 points. gains 0.75 points to make the count 3.5; , as in the solution, gains 0.75 points, as well, to make the local score 5. The hane-connect is a common endgame play. To evaluate it let's look at the two adjacent eyes. After Black plays White has 1 point there while Black has 7. The net local score is +6. By comparison if White plays hane-connect White gets 2 points while Black gets 6, for a net local score of +4. The original count is +5, and whoever plays hane-connect there gains 1 point. If White plays she scores 7 points on the right side. But if Black plays in sente, White scores only 6 points there. To play sente with sente gains nothing on average, so -6 is the original count on the right (from Black's point of view). White's reverse sente in the previous diagram gains 1 point. To verify that is sente, if White ignores it and Black plays with sente, White scores only 4 points on the right side. That shows that (at ) gains at least 2 points, which makes it bigger than the reverse sente ( at ). So is sente.